John Eiguren died Monday, January 21, 2019 at St. Al's Hospital, surrounded family. John was born in Washington, D.C. December 24, 1942 to Julio Eiguren and Annestelle Cancelmo Eiguren. Following the WW2, the family returned to Idaho and lived briefly in Boise and Caldwell before moving to Emmett, to be near family. The family moved to Stibnite in 1948, where his parents ran the recreation hall and later bought the store. In 1956 they returned to Boise briefly before finally settling in Emmett. 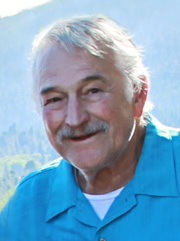 John attended Emmett schools and graduated in 1961. While there he played football briefly and participated in shot put in track. He had many jobs, including driving a truck and picking up milk for Osborn's, working in the orchard for his grandfather, John Gamage, and Radke Furniture. Following high school, he attended Idaho State University briefly before marrying Sandra Vahlberg in 1962. Two days after getting married, John joined the Air Force, where he worked in aircraft maintenance. He was first stationed at Amarillo Air Force Base before transferring to Mt. Home Air Force Base. He was a bomber crew chief and served time in Guam, supporting the Vietnam conflict. He and Sandra had two children, Tamie and Jeff, before divorcing and leaving the military. John married Carla Arnold, and they moved to Australia. They divorced shortly after, and John remained in Australia. He then met Julie Gerken Eagles, who had a young daughter, Katherine. While in Australia, they had a son, Julio. After moving to New Zealand, they had two more children, Rachel and Riley. John had a successful leather craft business, where he created shoes and belts. In about 1978, John returned to Idaho, where he began T & J Painting with his brother, Terry Eiguren. Shortly after, they dissolved the partnership and John continued on painting independently until retiring. Then the rest of the family moved to Idaho. Julie later returned to Australia with Katherine and Riley. His son, Julio, took over the business & changed the name to J & J Painting. John had a colorful personality. He enjoyed working on and collecting cars, attending car shows, mining for gold, firing his cannons, collecting many model ships, the Eiguren Ranch in Yellow Pine, his dogs, and spending time with his many friends. John is preceded in death by his parents, Julio and Annestelle Eiguren, son Jeff Schell, and cousin Pete Eiguren. He is survived by his brothers Tom (Barbara), and Terry (Trudy) Eiguren, his children, Tamie Schell, Julio (Angela), Rachael and Riley Eiguren, and grandchildren Amaya Schell and Josh Nett, and numerous nieces & nephews. The family would like to say a special thanks to Trini Tompkins, and the staffs at St. Al's and the VA.
A memorial service will be conducted at the Potter Funeral Chapel in Emmett at 5:00 p.m. on Friday, January 25, 2019.